The Speaker of the House presides over the House of Representatives and is the only officer of the House specifically mentioned in the Constitution. Other House leadership roles also are determined by membership in the majority or minority party. Party members also elect a majority leader and a minority leader, who both work closely with the speaker. Each party also elects a whip, who is responsible for persuading Members to support their own party's position on issues. Whips serve as communication links, distributing information about the party's position on issues from leaders to Members and alerting leaders to the concerns of party members. Click here to view a list of House leaders and to visit their websites. 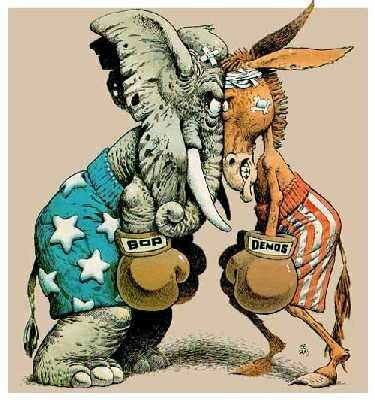 The majority party in the House of Representatives is the Democratic Party making the Republican Party the minority party. The 116th Congress currently includes 236 Democratic and 200 Republican Members of the House. The Republican Party also holds the majority in the U.S. Senate with 53 versus 45 Democrats plus two Independents who caucus with them.